In addition to our adoption and donor revenue – since we receive no government funding as a nonprofit organization – we rely on the additional generosity of like-minded organizations to help us fulfill our mission of 100% placement of adoptable animals … and that makes everyone happy! who supports us every day! Our friends at La Bodega – Soups, Salads, and Sandwiches – All Delicious! 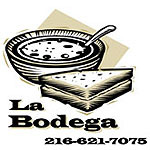 La Bodega is located at 869 Jefferson Street in Tremont and 3859 Superior Avenue in Cleveland.